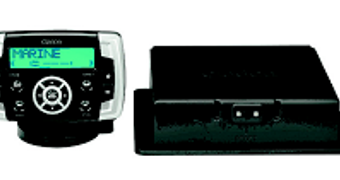 Clarion’s CMS1 is an AM/FM/Weather Band Digital Media receiver with a built-in 40Wx4 amplifier, USB Port (capable of playing MP3 and WMA files), iPod interface port, an auxiliary input, and a preamp output. The electrical design is unique because it uses an EEPROM to store information, so it does not require a constant power connection. This means the CMS1 doesn’t draw any current when you turn off the ignition, so there’s no chance of a dead battery. Clarion considers the CMS1 to be the perfect solution for boats that don’t have room for a conventional source unit, or for harsh environments. The two-piece system is comprised of a command centre and a hide-away brain module. You can connect an iPod to the CMS1 via an optional interface (CCUIPOD1) while enjoying the convenience of having the iPod battery re-charged at the same time. A USB port also lets you listen to all your favourite tracks by simply copying them to a USB stick and plugging it into the unit. For those who want it all, up to three wired remotes can run off the CMS1 unit. Just as importantly, the sleek unit has been designed to be weather resistant, and it also comes with a back-up memory. RRP is $459. Visit www.clarion.com/au for stockists.